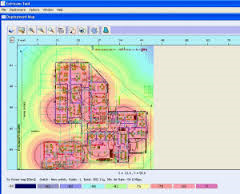 Netcom ICT use the latest software to analyse wireless coverage and optimum locations for access points. Netcom ICT are able to produce accurate CAD format drawings/plans of your buildings, so that we can deliver an accurate site survey within a number of days. 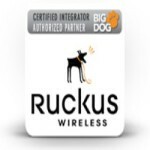 Netcom ICT utilise amazing products such as the award-winning Ruckus wireless, Extricom Wireless LAN and Meraki wireless System which incorporates multiple breakthrough innovations in a system that raises the bar for WLAN performance, flexibility, and ease of ownership. Groundbreaking architectural thinking gives you a solution that is fully IEEE 802.11-compliant, but changes all of the paradigms about the Wi-Fi experience. Provides stable, guaranteed performance, enabling the industry’s first Service Level Agreement (SLA) for WLAN users. Easy to deploy and maintain, without the complexities of RF cell planning. Delivers both seamless mobility and high capacity, with blanket coverage and no co-channel interference. Built for enterprise triple play, without performance trade-offs. In short, Extricom enables the All-Wireless Enterprise today. Voice (VoWLAN), data, and video, and location services are delivered with an always-on, robust and mobile Wi-Fi connection to any client, in any environment. The Interference-Free WLAN System is purpose-built to slash wireless complexity and future-proof your network for tomorrow’s multi-service demands. A new generation of applications, such as voice over Wi-Fi, locationing, “access anywhere” data connectivity, and multimedia communications, requires a new type of WLAN. At the heart of the solution is a simple yet powerful idea: eliminate the concept of cell-planning, and replace it with Channel Blanket architecture. In the Channel Blanket, each Wi-Fi radio channel is used on every access point to create continuous “blankets” of coverage. Multi-layer WLAN, composed of multiple overlapping Channel Blankets on any combination of channels in any band, powered from the same the set of access points. No AP-to-AP handoff, which ensures seamless mobility, continuity of security session, and optimal service delivery. TrueReuse channel processing, which multiplies per-channel capacity by enabling frequency re-use at higher density than traditional cell-planning. In the 21st Century, information literacy is critical for a student’s success later in life. Access to and experience with a wide range of IT applications is essential to ensuring this literacy. Infrastructure Flexibility: A school’s learning technology needs are as diverse as class sizes. A WLAN can be quickly rolled out virtually anywhere to meet those needs. Speed: Students can access a WLAN-enabled learning environment in a matter of seconds, without special connections or a tangle of cables. Resource Mobility: A WLAN allows technology learning tools such as laptops to be moved to wherever students are, rather than vice-versa. 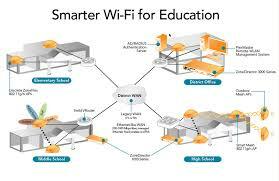 Small school IT departments are called upon to support large numbers of users, so the WLAN solution cannot require time-intensive configuration and administration. Wireless coverage issues are created by schools sprawling layouts and the need to provide connectivity to multiple users in the confined area of a classroom. Security compliance regulations require separation of student and faculty networks. Uncertain school budget processes require that the deployed WLAN ensure costs are kept low, leverage existing infrastructure, and offer advantages in terms of scale and price. 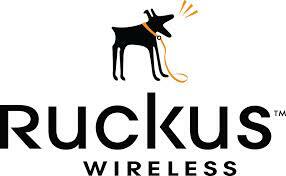 A hallmark of the Extricom WLAN system is its simplicity of deployment. The Extricom Deployment Tool is an easy-to-use software application designed to help you quickly decide the optimal position for Extricom’s APs, to maximize both coverage and capacity with minimal effort.